It's Wildlife Wednesday hosted by Tina at "My Gardener Says" and time to see what's been visiting my garden the past month or so. We'll start things off with a disoriented armadillo. These nocturnal creatures live near the dry creek behind our house. Overnight on Tuesday we had 9.25 inches of rain which flooded them out causing this one to become a temporary homeless wanderer in the dark cloudy morning. An armadillo moves pretty fast, especially when caught out of its element so this slightly blurry photo is the best I could do. 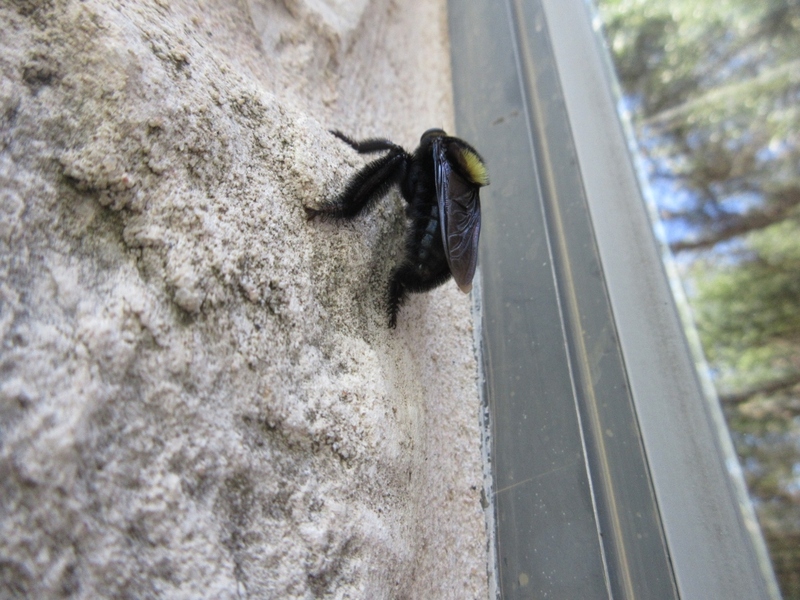 This is most likely a solitary bee I noticed clinging to the white stone wall of the house. A rare chance to get a closeup on a solid background. Nice legs! While visiting friend Paula Stone in Fredericksburg back in June we wondered what this unusual bug was. I tried unsuccessfully to get a good photo. Some type of bee or wasp? We'd just never seen one that looked quite like it before. Several weeks later Paula sent me the photo below. It's a Cicada Killer wasp. She saw it bring a cicada back to the garden. Cicadas live about five to six weeks and they were quite plentiful this year. It's cool to see how predators appear when the opportunity is right. 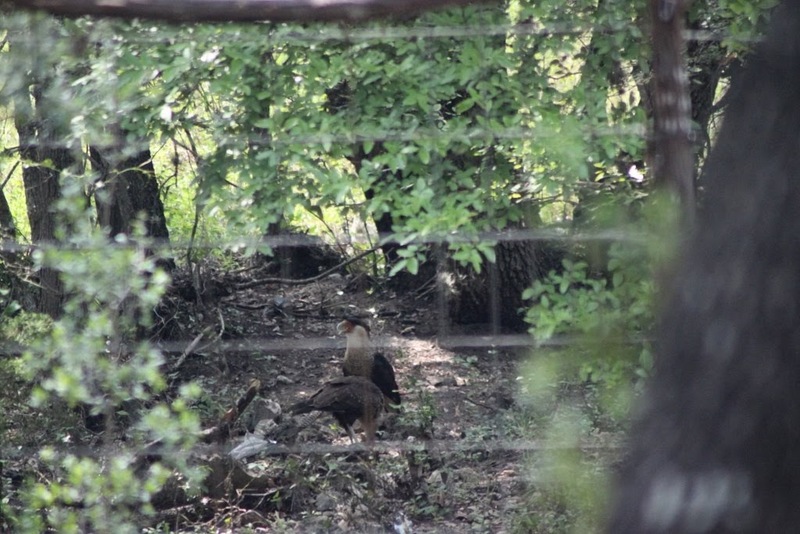 Magnificent Mexican Eagles or CaraCara are still here. 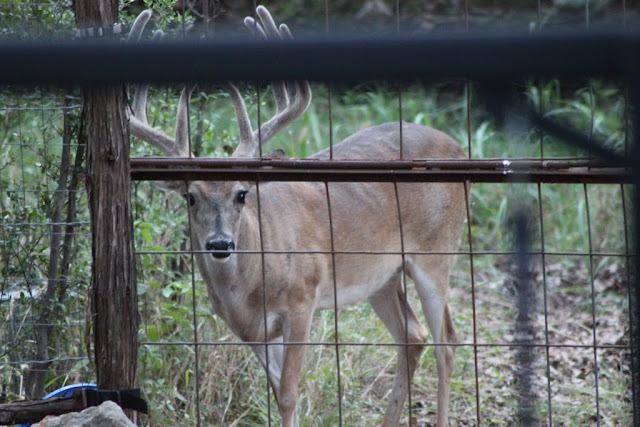 They hunt by waiting or walking around on the ground. September's GIF is a vulture looking for something that must have died in the creek. 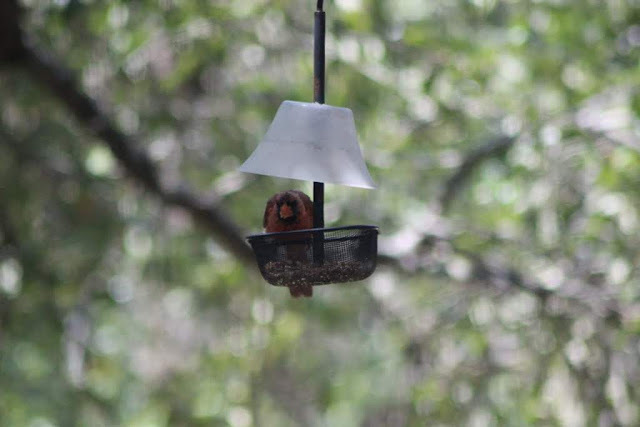 A male Cardinal at the feeder. 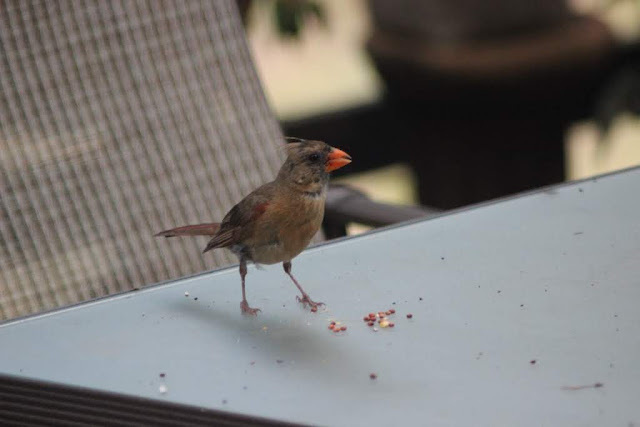 Although the pair politely take turns we sometimes put a second ration of birdseed on the table so both can feed at the same time. 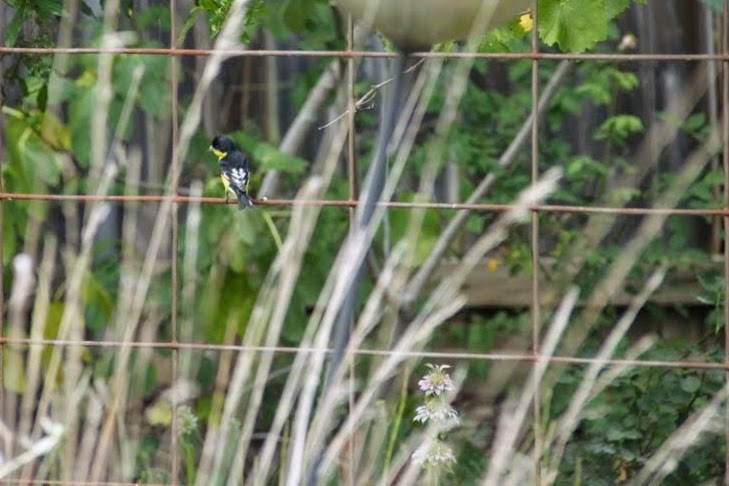 A male lesser goldfinch on the fence. The deep black and gold plumage is quite striking and the only thing "lesser" about this beauty is its size. 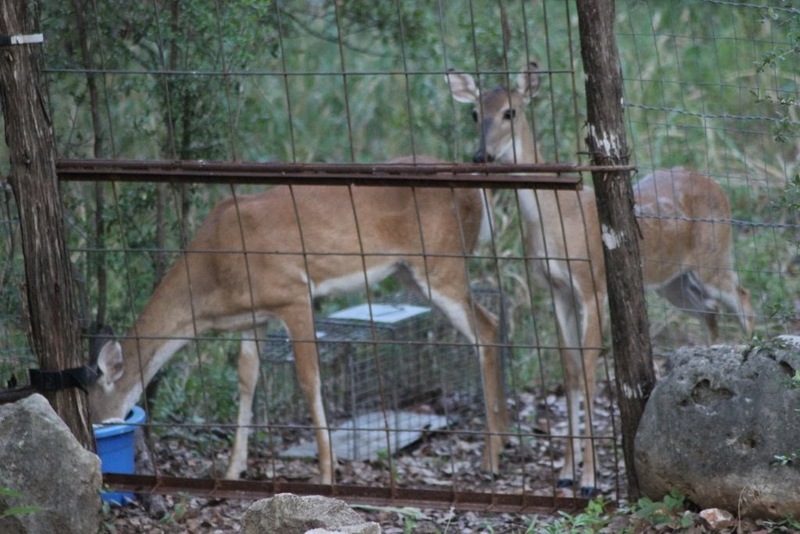 Whitetail deer have been gathering around the blue water bucket as our hot, dry summer continued. They are looking at all those yummy plants inside the fence. They have plenty to eat out there so, nope, no garden plants for them. We had quite a bit of rain over the weekend after these photos were taken but there are sure to be dry weeks ahead so the bucket will stay filled. That's the wildlife round-up for my garden as summer draws to a close so be sure to head on over to to Tina's post on Wildlife Wednesday to see what she and other bloggers have from their gardens this month. Lots going on! I like the cicada killer, they're so dramatic in color and size! 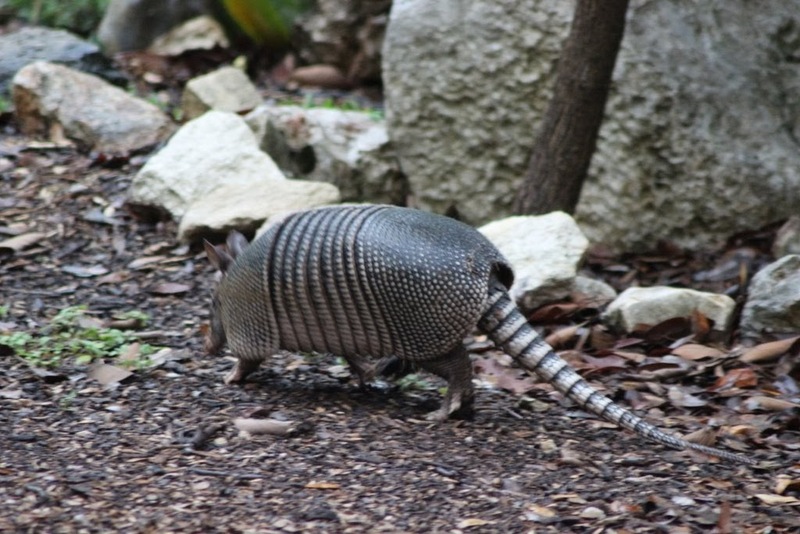 And, your quintessential Texas critter--the armadillo; that was a good catch! It's not easy to catch an armadillo. We would wear ourselves out chasing them as kids. I'd never seen a Cicada killer so thanks to Paula for helping me out with a photo and ID. 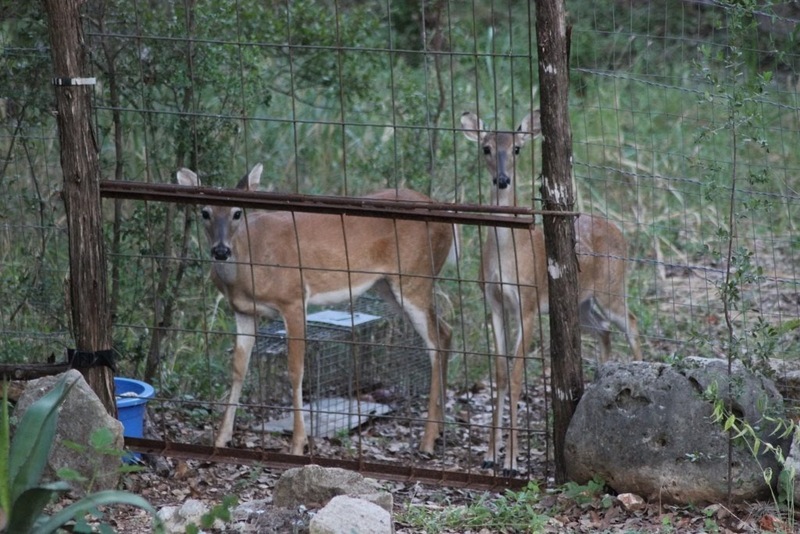 The deer are the meanies when they make a mess pulling up plants they won't eat. The name armadillo is pretty descriptive and they are fun to watch. I'm always amazed at how much wildlife you have and I love the armadillo picture. 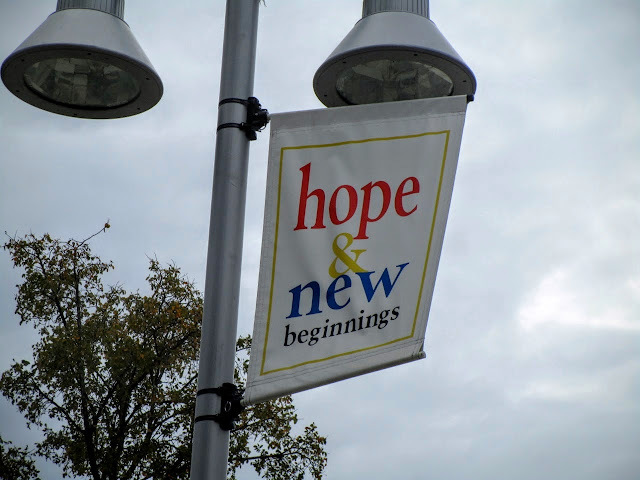 When I first moved to Texas (the first time) I didn't realize that they lived here in Texas. (Not sure where I thought they came from). I thought some students I had at an outreach program were pulling my leg. Poor kids. They probably thought I was crazy. I can imagine it would sound made up if you didn't know. It's a popular symbol for Texas so now you probably know they are everywhere. I always enjoy your wildlife posts. The shot of the armadillo, something I've never seen up close, looks great to me. Nothing but raccoons, coyotes and lots and lots of lizards here. I love watching lizard antics and they don't dig up the garden as the armadillos are prone to do. 9.25" of rain in a storm? Well, that humidity eventually comes back down to earth...we're on our way to 6" for the year. Cicada Killer - I remember those regularly in Albuquerque, but I never see them here. Armadillo! Yes, that Armadillo! So very Texan it looks odd without a cowboy hat. We had to look up the Cicada killer and were stumped until Paula saw it with a Cicada. Lots of good wildlife in your area! And 9.25 inches---dang. I'd take 3 of those...9 would send us into flooding again and I'm through with flooding for a few years. We already had a flood back in May even though it has been dry for about 6 weeks prior to that. You've had enough flooding for a lifetime. We've had some flooding but not like your area. We have more slope so there's faster draining too. The armadillo looks like a wood louse on steroids. One of those creatures that doesn't look possible!